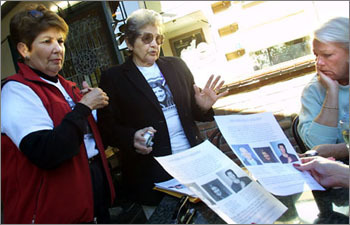 Still Searching: Lucy Sanchez Crumpton and Georgette Sanchez distribute flyers about Jeanine Sanchez-Harms, Georgette's daughter--who has been missing since July 27, 2001--to customers, including Pattie Monteverde at Hannegan's in Los Gatos. The parents of Jeanine Sanchez-Harms, who disappeared July 27 after an evening at the Pruneyard Shopping Center, are still hoping their daughter will be found or that solid leads about the case will materialize. The Campbell couple, Jesus and Georgette Sanchez, are the parents of the 42-year-old Los Gatos woman, who's been missing for six months. "Naturally we're down a little bit," Georgette Sanchez said, adding that she has called America's Most Wanted producer Steven Katz to feature the case again. She's also called ABC requesting a follow-up story about the case. "We just can't get closure until we find her, until we get some answers. I'm not going to let it go," she said. After six months of investigations, police are now scrutinizing the last two men thought to have seen Harms before her disappearance. Los Gatos-Monte Sereno police are hoping to gain more information on Santa Clara resident William Alex Wilson III, known simply as "Alex," 38, and Maurice Nasmeh, 42, of San Jose, who both have since stopped cooperating with police. The evening of July 27, Harms met Wilson at the Rock Bottom Brewery in Campbell for drinks. Later on in the evening, Harms met up with Nasmeh, and Wilson left the brewery. Nasmeh told police that he followed Harms to her Chirco Drive home; he left at around 12:30 a.m., leaving Harms sleeping on her couch. Detective Steve Walpole is looking for information from the public that may help in the investigation. Specifically, police want to find out about Wilson and Nasmeh's whereabouts and activities immediately after Harms' disappearance, any suspicious behavior from either of the men and any of their acquaintances who may have information about Harms' case. New fliers about Harms have been distributed throughout Bay Area communities, said Georgette Sanchez. The fliers will have a picture of the two men who last saw Harms and will include a write-up about the case. Harms' brother, Craig Sanchez, who lives in Olney, Md., told The Campbell Reporter in a telephone interview that he was disappointed with the police investigation. "As a family we were getting frustrated with the progress of the investigation and over the past two or three weeks, we have been expressing that frustration to the police department and council members. They have been fairly responsive to us." He added, "One of the key areas of our frustration is that the two people who were the last ones to see Jeanine have not been cooperating with the investigation. We aren't accusing anybody of anything but we are a little upset that the ones who last saw her are not cooperating. We had asked the police department if there was anything it could do to force these people to cooperate. Just recently the police distributed a new flier which has both their pictures in it." "It's just common sense that the people who were last seen with Jeanine would have the most valuable information to help us find her," he said. Loretta Meyer, one of Harms' closest friends from Campbell's Prospect High School, echoed similar sentiments. "Personally I'm disappointed in the lack of evidence that the Los Gatos-Monte Sereno Police Department has found. I'm also disappointed at the lack of police officers that have been assigned to Jeanine's case." About three weeks ago, Georgette Sanchez wrote a letter to Santa Clara District Attorney George Kennedy expressing her concern and disappointment. Since then, the police department has reassigned Detective Kerri Wahl to the case, Meyer said. The Campbell woman also said it's getting more difficult for Jeanine's parents, family and friends to hope the case will be solved soon. "We went through Thanksgiving, Christmas and New Year's with no Jeanine. We still don't know what happened to her or where she is," Meyer said. New fliers of Jeanine will be circulated in the community with the help of the San Jose-based Childquest organization, which helps locate missing children in the area, Meyer added. Jeanine's parents contacted Childquest to help them distribute the fliers. Businesses in downtown Campbell will be targeted as well as businesses in downtown Los Gatos, Meyer said. "We're all disappointed," she said. "When this first happened, Chandra Levy was missing for three months and I couldn't fathom what her friends and family were going through, and here we are six months later and we still haven't found Jeanine." To contact Detective Walpole, call 408.354.8600 or 408.395.1101 for the 24-hour anonymous tip line. The police department can also be reached via email at police@town.los-gatos.ca.us. The reporter is not related to the Sanchez family. Gloria Wang contributed to this story. Copyright © SVCN, LLC. Maintained by Boulevards New Media.